The holidays are just around the corner, which means it’s time to start thinking about decorating for the season. Use LEDs. Decorating for the holidays means different things to different people. Some revelers blanket their homes with twinkling lights and other decorations, both inside and out. While others take a more modest approach to the season by simply sprucing up for guests with a few well-placed accent lights to enhance their home’s curb appeal. 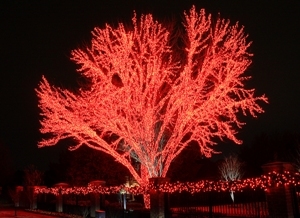 Whatever your holiday decorating scheme, you will make the biggest impact visually and financially by using LEDs. According to the Department of Energy (DOE), LED holiday lights have an estimated lifespan of 40 holiday seasons, are more resistant to breakage – thanks to epoxy lenses – than incandescent versions, and use less electricity. LEDs make sense for fixtures used year-round as well. The right lighting can make all the difference when it comes to giving your home an inviting appeal. To help your holiday guests feel welcome, make sure your exterior lights have proper light levels and color temperatures. Redirect floodlights to be sure they are not mounted to shine directly into visitors’ faces. While you’re at it, you can easily change existing fixtures for ones that use LEDs, which will provide excellent lamp-life and low-energy consumption. Look for a focal point on your property that can be accented with lighting to provide a nice contrast of color. Tree lighting uses the heights of the trees to spread the light out in a soft and subtle way to bathe the area in light. The more height you have to work with, the more spread of light you can achieve. With color-changing LED technology, you can create the perfect ambiance for your holiday gathering. A Hortons Home Lighting professional can create an inviting and welcoming look for your home. would like LED or CFL surface-mounted ceiling fixtures or suspended fixtures with color temperature of 2700-3300K for my kitchen, which has an eight-foot ceiling. What do you suggest?- Christopher B. The range of products available in those categories is quite extensive. In recent years, lighting manufacturers have introduced hundreds of LED and CFL surface-mounted and pendant fixtures. Your best bet is to go to the Hortons Home Lighting website to find your closest Hortons Home Lighting location. They will have many of these products on display, and the lighting consultants on their staff can assist you in making the best selection.